A still of CGI effects used to describe what space actually is in the new NOVA series "The Fabric of the Cosmos" on PBS airing in November 2011. Sometimes what you see and what you perceive aren't at all what they seem. That is the message of acclaimed physicist Brian Greene's new television series. In "The Fabric of the Cosmos," a four-hour NOVA series, Greene takes viewers on a mind-bending journey to the frontiers of modern physics, where theories of space, time and the universe are challenging scientists to re-think everyday perceptions. "The Fabric of the Cosmos" explores the mysterious ingredients that are thought to occupy the seemingly endless void of space, the notion of time travel, the fascinating realm of quantum physics, and cutting-edge theories about the universe, including the idea that ours may not be the only one. SPACE.com: This TV series is based on your book, "The Fabric of the Cosmos," which tackles some of the most compelling questions and ideas in modern physics. Taking all that material and condensing it into four one-hour episodes must have been challenging. Physicist Brian Greene hosts the NOVA series "The Fabric of the Cosmos" on PBS. Brian Greene: It was a huge challenge. It's a matter of trying to find those ideas that really transformed our thinking, stripping away the details and allowing those ideas to really carry the story. SPACE.com: You've done a great deal of educational outreach aimed at engaging people inside and outside the science community — ranging from your books to events like the World Science Festival here in New York. What kind of audience are you hoping to reach with this NOVA series? Instead, we try to find ways, through animation and through the compelling human story behind the discoveries, to make the journey one that is exciting and has a strong momentum that keeps you moving through the ideas. SPACE.com: You took part in a panel discussion a couple of weeks ago at New York Comic Con, and you shared some clips from the show. What type of reaction did you get from the audience? Greene: It was great. The audience was really excited about the various clips and the discussion we had about them. We showed something from our show on time travel and we showed another clip on the multiverse. The idea that there could be other universes out there is really one that stretches the mind in a great way. The audience, as I was leaving, a number of people were saying they want to see more, so that was great. SPACE.com: While we're on the topic of the multiverse, the theory that our universe could be one of many is pretty fascinating. What could these alternate universes be like? Is it possible that they're completely different from our universe, or could there be alternate versions of you and me somewhere out there? Greene: Both. As we describe in the program, which is the last in the series, research in cosmology is now suggesting that there really could be other universes out there. Some might be vastly different from ours, but if you follow the math, it suggests that at least some would be just like ours. And, as you suggest, some of those would actually have copies of us, which is a decidedly odd idea. In the program, a handful of scientists, some of whom are instrumental in discovering some of these ideas, react to that possibility. Some say it makes them depressed, some say they find it exciting. It's the human reaction of the scientists to where the science may be taking us. SPACE.com: How early can theories of a multiverse be traced back? Are these considered new ideas? Greene: People have definitely speculated before. My latest book — which is not the one on which the TV series is based — 'The Hidden Reality,' traces nine different variations on the theme of alternate universes, some of which go back to the 1950s. The one that we focus on in the program is a more recent discovery — 10 or 15 years ago — that people have been developing. SPACE.com: A common theme throughout the series is that everyday perception is not at all what it seems. What are some of the other overarching themes or lessons from all four episodes that you hope viewers will take away? Greene: Well, that using the power of mathematics, we've been able to peer very deeply into the nature of reality, and some of the insights that math has given us have already been confirmed beyond any doubt. And, that gives us some reason to anticipate that some of the weird ideas that math is pointing to now, may actually be right. The series is laying out these possibilities. SPACE.com: This is not the first time that a television special was based on one of your books (Greene's "The Elegant Universe" was also made into a PBS special). Are there some things that are easier and other things that are more challenging about presenting complex ideas and theories visually for TV audiences versus in a book? 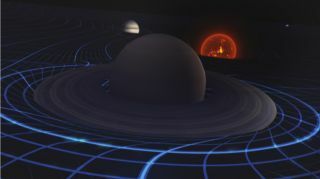 A still of CGI effects used to describe Earth and space in the new NOVA series "The Fabric of the Cosmos" on PBS airing in November 2011. Greene: It's a very different process. In a book, you can go into much more detail with the expectation that the reader can flip back, can mull something over at their own rate and then go forward when they feel they've got it. In the television context, you've really got to communicate immediately. It's rare that someone, even if they're watching it on DVD, will stop, rewind and listen again. The flip side, though, is that there can be material that will take me pages of words to describe but a potent animation can get the idea across in a handful of seconds. SPACE.com: With all the advances that we've made to date, it seems like a lot of the discoveries that we make about our universe also come with more unanswered questions and mysteries, such as dark matter and dark energy. Do you think we really know more about our universe today than we ever did? Greene: That's a good question. There are spectacular insights that give me, and I think my colleagues, the sense that we do have a deeper understanding of the universe. At the same time, deeper understanding allows you to ask questions that you wouldn’t have been able to think of until that deeper understanding materialized. So, it's a wonderful process of diving deeper into the way things work and discovering a whole new universe of puzzles in the process. SPACE.com: Do you think we're close to figuring out what dark matter is? Greene: For dark matter, I think the answer is yes. I think in the next few years, we'll either know what dark matter is, or the idea may be ruled out and we'll have to come up alternate explanations. For dark energy, it's a very different story. We have a lot of insight into the effects of dark energy, but really not a clue as to where it comes from and why it's there. SPACE.com: A lot of the theories that you touch on in "The Fabric of the Cosmos" — things like a multiverse, wormholes and time travel — have kind of always been more in the realm of science fiction. Are we finding out that these things could be more realistic than we thought, or is it that perhaps sci-fi has always been more steeped in reality than we sometimes give it credit for? SPACE.com: Personally, when you look ahead to the next couple of years, what is one research topic that you would really like to focus on? Greene: I would love to find a concrete cosmological or astrophysical signature of fundamental theories like string theory. To me, there would really be nothing more wondrous or poetic than to test out theories of the tiniest things by careful observation of the biggest things. And, there's reason to think that that may actually be possible. SPACE.com: I know that encouraging people, especially young people, to take an interest in science, physics and cosmology, has always been important to you. Based on your personal experiences, and on pop culture indicators like the TV show The Big Bang Theory, do you think there has been increased interest in these fields? So, I think little by little, we're chipping away at the silo within which science has found itself for a long time, which is isolated to people in academia, viewed as something only the most nerdy, or social outcast would want to spend their time on. It's never been that way, but the sciences tended to have a reputation like that. NOVA's "Fabric of the Cosmos" begins Wednesday, Nov. 2 on PBS at 9 p.m. ET/PT (check local listings).